Two Battalion Histories have been written about Victoria’s famous 7th Battalion in World War One. 'Resume of Activities of the Seventh Battalion in the Great War 1914-1918 ' by A. Dean & E. Gutteridge. The second 7th Battalion History Book,‘ Our Dear Old Battalion The story of the 7th Battalion AIF 1914-1919‘ was published in 2004 being written by Victorian Military Book author, Ron Austin. Gutteridge was a Medical Officer with the 7th Battalion during World War One. He served with the 7th Battalion on Gallipoli and the Western Front. Dean joined the 7th Bn in July 1915 later being commissioned as a Lieutenant. He was twice wounded, at the Battle of Broodseinde in 1917 where he suffered a gunshot wound and was later gassed. After the war he was admitted to the Bar, becoming a High Court Judge in 1949. He was Knighted in 1960 and died in 1970. Gutteridge completed the Gallipoli section while Dean wrote the history of the Battalion’s activities on the Western Front. Although, both Authors had served with the Battalion during WWI they were somewhat disadvantaged due to the destruction of Battalion records during a bombing raid in 1918. Remembering, that the book could only be produced to the best standards available in the 1920’s / 1930’s. No doubt the Depression would have had an influence on the production of the book. Jamieson and other members of the 7th Battalion. Not withstanding, that the magnificent collection of Australian War Memorial is available to todays researchers. Computer printing techniques obviously allow for low cost reproduction of photographs. Not to forget, Ron Austin’s dedication, knowledge and experience as a military book author. Thus the ‘ Our Dear Old Battalion ‘ Battalion History is greatly expanded in detail including numerous photographs, maps, and complete rolls. Appendix include POW Roll, Honour Roll, Medal Awards Roll, Citizen Enlistments Roll, Nominal Roll, and is fully Indexed. Why compare buy both of these military books ! Short 7th Battalion AIF Anzac WWI History. Australia declared war with Germany on the 4th August 1914. A patriotic fever had gripped the nation. The newly formed Australian Imperial Force (AIF) quickly organised the already existing local Militia/Citizen Military Forces, AMF units to join the AIF. Lieut-Colonel Harold E. Elliott was given command of the 7th Battalion AIF. Elliott from Ballarat, had been awarded for gallantry with a DCM medal during the Boer War. He was said to be as ‘straight as a rule’, outspoken, intensely headstrong, a dour fighter and was well known for his impulsive nature. As a Commander he was loved by his men who nicknamed him Pompey Elliott. The newly formed 7th Battalion was a Victorian Battalion, with members coming from Bendigo, Castlemaine, Kyneton, Echuca, Bacchus Marsh, Shepparton and the Goulburn Valley with several companies coming from the inner suburbs of Melbourne. Training was carried out at Broadmeadows Camp, on the 20th October 1914 the Battalion set sail for England as part of the 1st Contingent. During the trip over, it was decided for several reasons, that the AIF should be based in Egypt. Further desert training was undertaken for several months. 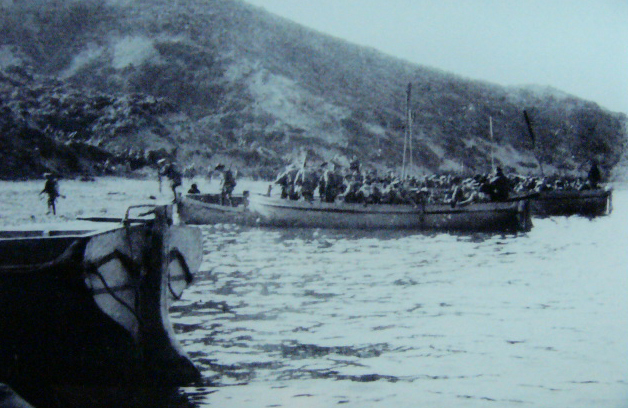 In preparation for the Gallipoli Landing the 7th Battalion arrived at Lemnos Island on the 11th April 1915. Here the Battalion trained embarking and disembarking from rowboats. The Battalion’s landing at Gallipoli was made around 5.30am on the 25th April 1915. About an hour after the 3rd Brigade had landed. The Battalion was to secure the northern or left flank of Anzac Cove. A tragedy occurred when B Company rowboats, making for the Fisherman’s Hut, came under heavy fire from rifle and machine gun. In one boat, carrying 140 men only 16 made it ashore. 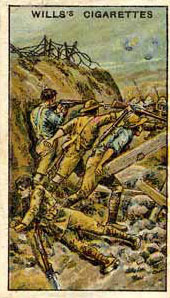 Those 16 then made a gallant bayonet charge against the Turkish trench – they succeeded in taking the trench. At 8.30 am Pompey Elliott was shot in the ankle and was forced to retire (the very boot that Elliott was wearing that morning is located in the Australian War Memorial). On the 8th May 1915 the Battalion took part in the Charge on Krithia. It was 7th Battalion men that Brigade Commander McCay led forward crying “Come On Australians!”. The machine gun fire was so fierce that 7th Battalion soldiers were seen going forward holding their spade in front as a shield. The Battalion had sustained heavy losses the strength being only 8 officers and 366 men. Elliott, recovered from his wounds, returned to Command the 7th Battalion on the 3rd June 1915. On the 9th August 1915, during the Battle of Lone Pine the Battalion was distinguished when four members, Corporal Alexander Burton, Corporal William Dunstan, Lieutenant Frederick Tubb and Lieutenant William Symons were awarded the Victoria Cross.